The Golden Nugget Las Vegas is a luxury casino-hotel on the Fremont Street Experience. It is the largest casino in the downtown area, with a total of 2,345 deluxe guest rooms and suites. It has also maintained AAA’s Four Diamond rating consecutively for 32 years from 1977 through 2009. It is one of only two resorts inside the city limits of Las Vegas to earn this distinction, the other being The Resort at Summerlin. The property is owned and operated by Landry’s Restaurants. Casino: Yes, 38,000 square feet. There are approximately 1,200 slot and video poker machines and 50 table games. Casino games include Blackjack, Caribbean Stud Poker, Craps, Keno, Let It Ride, Pai Gow Poker, Poker, Roulette Slots, Baccarat and Megabucks. The casino has a poker room. Race & Sports Book: Yes, a country-club-style race and sports book, equipped with seven betting stations, multiple plasma televisions, 62 plush seats and four booths with private screens. Restaurants: The Golden Nugget has the following dining options: The Buffet, Chart House, Lillie’s Noodle House, Vic & Anthony’s, Grotto Ristorante, Red Sushi, Carson Street Cafe, Starbucks and a snack bar. Entertainment: Yes, visiting headliners in the 600-seat showroom, as well as impressionist, singer and entertainer Gordie Brown and Country Superstars Tribute. Nightlife: RUSH Lounge and Gold Diggers Nightclub. 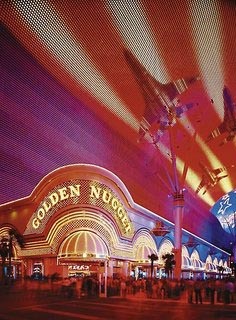 Attractions: The Golden Nugget is home to the Hand of Faith, the largest single nugget of gold in the world. It weighs a massive 61 pounds, 11 ounces and is displayed (free of charge) with another nugget weighing 13 pounds. The resort also has a 200,000-gallon aquarium located on the pool deck. This aquarium houses several shark species and is part of a three-story pool complex complete with waterfalls and an enclosed waterslide that passes through the aquarium. Pool: Yes. The Tank features one pool and one Jacuzzi, as well as a 200,000-gallon aquarium, the centerpiece of the resort’s pool complex. Health Club or Fitness Equipment: Yes. Spa: Yes, The Spa at the Golden Nugget. Shops: Yes, two high-end boutiques: Perfect Timing watch shop and Style and Trend, featuring men and women’s apparel. Also, two 24-hour gift shops. Wedding Services: Yes, the Wedding Chapel at Golden Nugget offers a number of wedding ceremony packages and services. Business Center: Yes, located in the South Tower. Facilities offer faxing, copying, high-speed Internet (T1) capabilities and shipping through FedEx among other services. Convention Rooms: Yes, 14 rooms totaling 36,000 square feet and rooms ranging in size from 510 to 11,040 square feet. In-Room Internet Access: Each room has both wired and wireless dial-up and high-speed internet access (for a fee). Hotel Amenities: Beauty salon, laundry, luggage and maid service, safety deposit box and wake-up call. Parking Garage: Yes, a six-story parking garage. Shuttle Service to the airport: Shuttle service to and from the airport available for a fee from an outside company. Shuttle Service to the Strip: No. Standard Room Amenities: Air conditioning, alarm clock, hair dryer, in-room safe, iron and ironing board, pay-per-view movies, telephone and voice mail, remote-controlled cable TV, electronic door locks and radio. Minimum Age to Reserve a Room: 18 years. Policies:The maximum total number of guests (adults and children) in a room is four. Incidental Charges: Hotel requires a credit card or a cash deposit for incidental charges.